Allows the use of central IT services. The data is encrypted when transmitted via the Internet. Virtual Private Netwoks (VPN) allow branch offices, home offices or external employees to connect to the central office via the Internet. It is the lowest-cost option for Network Services. The primary reason for the use of VPN services is the use of a central IT infrastructure. This is a logical network which is implemented on a publicly accessible network infrastructure (Internet). There are two principle variants. Side-to-Side VPN: A side-to-side VPN is the preference for connecting branch offices. This requires a VPN router at both locations. These VPN routers then establish the necessary VPN tunnel between the respective locations. 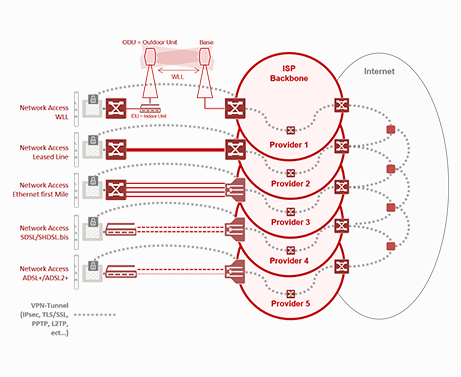 User-to-Side VPN: User-to-side VPNs are the preference for integrating mobile users into the company network. The user can use any available Internet connection. The company network is accessed via a VPN client which is installed on a laptop or PC. The professional alternative to an Internet VPN is an MPLS network. This is a network that is managed by the provider that does not run via the public Internet. IPsec: The integrity and confidentiality of IP packets are secured. Benefits of IP Sec: Since only an Internet browser is required for access, no additional software is required on the client side. In principle, any end device can be used as a “work tool”, an employee’s personal computer, the hotem terminal and even PCs at Internet cafes. The operating system also doesn’t play a role, initially. SSL VPN: SSL is an encryption protocol that is transmitted via IP and UDP or TCP like conventional Internet traffic. IPSec or SSL? One aspect of security is the question as to which protocol, IPSec or SSL, the VPN solution should use. Both variants are now considered “equally secure”, however, IPSec has a longer proven track record and is often already otherwise anchored in the company’s IT. In contrast to that, SSL-based solutions score points due to greater flexibility and easier administration. A slight trend with regard to the use of the protocols can be seen: IPSec is often preferred when connecting entire branch offices, while SSL is more effective for connecting individual people. In comparison to an MPLS VPN, operating an Internet VPN does not require a provider. A VPN can be set up on any Internet line using a VPN router. This can be implemented by the in-house IT department or by a systems company. In comparison to MPLS networks, the costs are low. The reason for this is the fact that the lines are not dedicated. I.e. the VPN is implemented via conventional Internet lines. In addition, there are one-time costs for a VPN-capable firewall and, if necessary, its maintenance. Also take a look at my Blog!